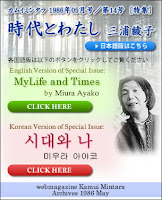 Kamui Mintara's special issue focusing on Miura Ayako's life and times, which I was asked to translate into English (introduced in earlier post), has now been translated into Korean. Copies are available free to visitors of the Miura Ayako Literature Museum in Asahikawa. You may also be able to get them in bulk by contacting the sponsoring organization, Rin'yu Kanko (contact information at the end of each language version of the special issue). Follow the links here to get to the original Japanese version, the English version, and the most recent Korean version.